World Silver for STORM® Canis Advocate Bethan Fitzgerald who heralded a team effort from the Fitzgerald family. 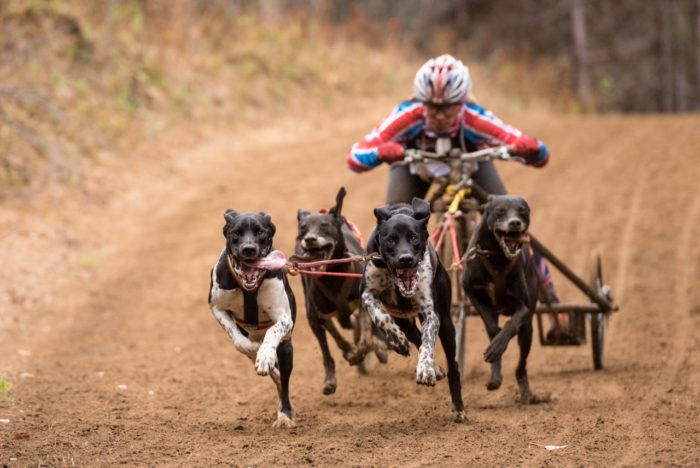 Danny and Beth recently embarked on a mammoth trip, flying their dogs to Canada to compete at the dry-land sled dog World Championships. Alongside four other Team mates, they all managed to work together to complete the almost impossible task of getting dogs and equipment from A to B and keep them well hydrated, fed and supple! They stayed on the same feeding regime and they kept their weights and condition well. One of the dogs ran 2 days with Danny on the bike and then in Beth’s 4 dog team with no sign of tiredness. Supplements like STORM® Canis have a huge role in keeping the muscles fresh and go on herbs gets the maximum energy out of them. Bethan won silver, the title of “second fastest 4 dog team in the World!” She says “I’m so proud of my dogs, I had two 7 year olds and two 5 year olds, one of which had already ran the previous two days, they averaged over 21mph, words can not describe the feeling of pride for my dogs”. Daniel took 8th place on the bike, this was an fantastic result as this class had some amazing biking athletes and dogs who have the advantage of training full time. Beth says “it’s all about what you do with your dogs months before the race, the right food, supplements and of course training. There is no other dog sport that asks a dog to work as hard as he/she can for just the fun of it”. Thanks to CSJ and STORM® Canis for their support, without them, silver may have not been achievable.